When NASA announced liquid water on Mars, they meant a solution salty enough to kill most living things on Earth. 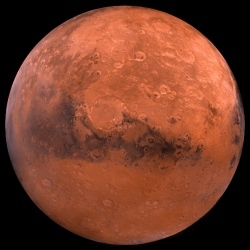 Temperatures on Mars are below zero, so any liquid water would have to be loaded with salt, and probably not sodium chloride but something nastier; perchlorates, which are used in rocket fuel. You wouldn’t want to drink it, but such a toxic brew wouldn’t kill everything, says biologist Shiladitya DasSarma of the University of Maryland, who studies salt-loving organisms, known as halophiles. These organisms flourish in the Great Salt Lake, the Red Sea, and the world’s briniest marshes. Some have been isolated from a frigid lake in Antarctica. “I think it’s quite possible there are halophiles that could survive on Mars,” he says. Bugs with extreme adaptations tend to be useful because evolution has endowed them with proteins that have unusual resilience to heat, salt, chemical exposures, or other conditions that might be necessary for some industrial or medical process. Researchers borrowed an enzyme from a bacteria that thrives in the hot springs in Yellowstone National Park at temperatures as high as 131 F° to invent one of biology’s most useful tools, polymerase chain reaction, or PCR. Halophiles, too, have had important uses, especially those from a group known as archaea, says DasSarma. These are not bacteria but belong to a separate and more ancient domain of life. While some halophiles adapt to their surroundings by keeping salt out of their cells, these halophilic archaea let themselves fill up with salt. “These guys have a high salt concentration inside and outside,” he says. The essential trick of the halophiles is to make proteins that don’t die of thirst, he says, as they are competing with the ions in the salts for access to water. Their ability to survive in high salt solutions also makes them useful for other process where there’s little or no water, such as catalyzing chemical reactions in organic solvents. The University of Connecticut chemist Robert Birge is working with proteins from a halophile called Halobacterium salinarum, a member of the archaea that lives in salt marshes. The organisms make a protein called bacteriorhodopsin, a pigment that dyes marshes a deep red or purple. Since the pigment is used by the organism to absorb light and use it for energy, he’s been adapting it for optical memory storage and optical processing. Most recently, he’s been researching the use of the pigment for a three-dimensional memory storage system called holographic memory, in which lasers etch data into the protein. A few years ago, one of his students conceived of using bacteriorhodopsin for an artificial retina. Now they’ve built prototypes and found they can restore sight in animals. Mars life, if it exists, might look very much like these halophiles or quite different, depending on its origin. Some scientists think that we might find Mars life that’s related to life on Earth, as the two planets have been swapping rocks since their formation and it’s not impossible for something deep inside a meteor to survive the journey. The other possibility is that life sprung up from an independent origin on Mars, in which case it may use a radically different biochemistry. Such a finding would profoundly change our understanding of the nature of life, since all life anyone has ever seen is related through a common origin. That’s made it hard to know what other kinds of life might be possible.